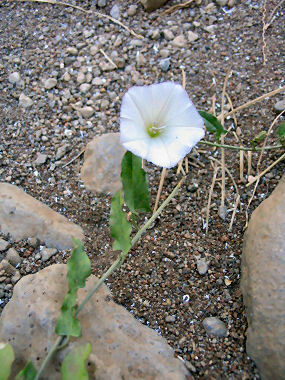 Field Bindweed is a member of the Morning Glory Family. The plant appears as a trailing vine growing to 4 inches in height with dark green, arrow shaped or triangular leaves that grow to 2 inches in length on one side of the stalk. The plant typically grows in fields, clearings and disturbed areas throughout Arizona. Field Bindweed was introduced to the US from Europe and is considered a troublesome weed. Field Bindweed blooms between May - September and produces a white to pinkish funnel shaped flower with 5 petals to 1 inch in width.